Transparency Market Research (TMR) has published a new report titled, “Prescription Dermatology Therapeutics Market - Global Industry Analysis, Size, Share, Growth, Trends, and Forecast, 2018–2026”. 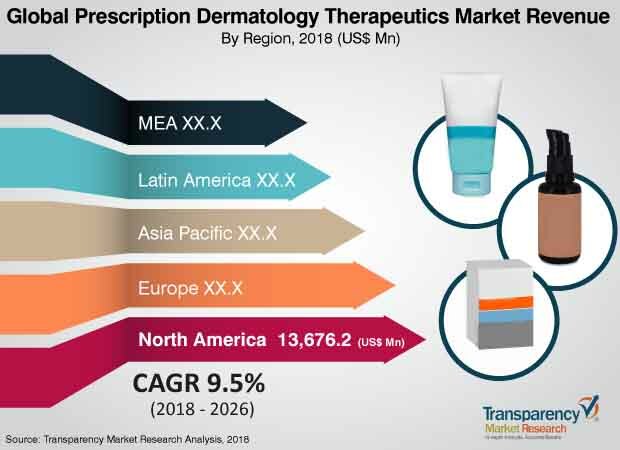 According to the report, the global prescription dermatology therapeutics market was valued at US$ 27,580.0 Mn in 2017 and is projected to expand at a CAGR of 9.5% from 2018 to 2026. High prevalence of chronic dermatological disorders, large unmet medical needs, and new product approvals are anticipated to drive the global market in the next few years. North America is expected to dominate the global prescription dermatology therapeutics market during the forecast period, followed by Europe. Potential unmet medical needs for moderate to severe psoriasis and skin cancer, increase in adoption of biologic drugs, and new product approvals & launches in the U.S. and Europe are likely to drive the prescription dermatology therapeutics market in these regions during the forecast period. The market in Asia Pacific is projected to expand at a high CAGR during the forecast period. High prevalence and rise in incidence rate of various chronic as well as acute dermatological disorders across the globe are the key factors driving the global prescription dermatology therapeutics market. According to the World Health Organization (WHO), over 900 million people were affected with skin diseases in 2017, and the five most common skin disorders account for around 80% of the skin disorders. Atopic dermatitis, a common and chronic inflammatory skin disease, affects 15% to 20% children and 1% to 3% adults across the world. According to the WHO, 2 million to 3 million patients are affected by non-melanoma skin cancer and around 132,000 melanoma skin cancers occur across the world each year. Hence, rise in incidence rate of dermatological disorders across the globe and increase in awareness about various skin diseases are projected to propel the global prescription dermatology therapeutics market during the forecast period. The report offers a detailed segmentation of the global prescription dermatology therapeutics market based on different prescription dermatology therapeutic products approved and commercialized for dermatological indications. Based on product type, the global market has been segmented into acne & rosacea drugs, psoriasis drugs, dermatitis & seborrhea drugs, fungal infection drugs, skin cancer drugs, and others. High prevalence of psoriasis and significant rise in number of psoriasis patients across the globe are projected to fuel the growth of the psoriasis drugs segment during the forecast period. According to the International Federation of Psoriasis Associations, over 125 million people were affected with psoriasis globally in 2015. Moreover, various studies have shown that between 10% and 30% of patients with psoriasis tend to develop psoriatic arthritis. Furthermore, most of the biologic drugs are approved for the treatment of only psoriasis. High adoption of biologic drugs in the developed markets contributed to high share of the psoriasis drugs segment in 2017. Promising biologic product pipeline for psoriasis treatment and anticipated commercialization of the late stage clinical biologic products are likely to augment the psoriasis drugs segment during the forecast period. In terms of distribution channel, the global prescription dermatology therapeutics market has been segmented into hospital pharmacies, retail pharmacies, and mail order pharmacies. The hospital pharmacies segment is projected to account for significant share of the market by 2026. Rise in the number of hospital admissions of patients with various chronic disorders especially psoriasis and skin cancer, and high cost of treatment are anticipated to contribute to high share of the segment in 2026. Promising biologic product pipeline of leading biopharmaceutical companies is likely to receive approval and commercialization in the near future. Biologic drugs are most commonly and easily available at hospital pharmacy stores. Hence, expected launch and commercialization of biologic therapeutic drugs for dermatology is likely to drive the hospital pharmacies segment during the forecast period. The prescription dermatology therapeutics market in Asia Pacific is projected to expand at a high CAGR during the forecast period. High prevalence of dermatological disorders in highly populated countries such as China and India, rapidly improving health care infrastructure, increase in access to health care facilities, and rise in per capita health care expenditure in the region are likely to fuel the growth of the market in Asia Pacific during the forecast period. Large base of pharmaceutical companies in countries such as India, Japan, and China also contributes to the growth of the market in the region. High demand and increased adoption of biologic drugs in the developed markets such as Australia & New Zealand is projected to propel the prescription dermatology therapeutics market in Asia Pacific. For instance, in Australia, the number of patients with severe psoriasis receiving treatment under the Pharmaceutical Benefit Scheme (PBS) with biologics has increased by more than 60% between 2014 and 2016. The global prescription dermatology therapeutics market is highly fragmented, with large number of global players accounting for a major share in respective region. Leading players in dermatology therapeutics are engaged in mergers, acquisitions, and strategic collaborations to strengthen dermatology portfolios. For instance, more than 20 mergers, acquisitions, and strategic collaborations have taken place between 2014 and 2018. Most biopharmaceutical companies have invested significantly in clinical R&D for the development of dermatology therapeutics products for different chronic dermatological disorders. Key players operating in the prescription dermatology therapeutics market include AbbVie, Inc., Janssen Biotech, Inc., Novartis AG, Amgen, Inc., Celgene Corporation, Pfizer, Inc., LEO Pharma A/S, Eli Lilly and Company, Bausch Health Companies, Inc., Sun Pharmaceuticals Ltd., Aclaris Therapeutics, Inc., and Aurobindo Pharma Ltd.